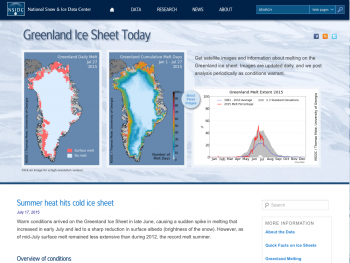 On September 9, 2011 sea ice extent dropped to 4.33 million square kilometers (1.67 million square miles). This appears to have been the lowest extent of the year, and may mark the point when sea ice begins its cold-season cycle of growth. However, a shift in wind patterns or late season melt could still push the ice extent lower. This year’s minimum was 160,000 square kilometers (61,800 square miles) above the 2007 record minimum extent, and 2.38 million square kilometers (919,000 square miles) below the 1979 to 2000 average minimum. Note that our estimated uncertainty for extent is plus or minus 50,000 square kilometers (about 20,000 square miles). The minimum ice extent this year is very close to 2007, and indeed some other research groups place 2011 as the lowest on record. At this point, using our processing and sensor series, the 2011 minimum is a close second. The last five years (2007 to 2011) have been the five lowest extents in the continuous satellite record, which extends back to 1979. While the record low year of 2007 was marked by a combination of weather conditions that favored ice loss (including clearer skies, favorable wind patterns, and warm temperatures), this year has shown more typical weather patterns but continued warmth over the Arctic. 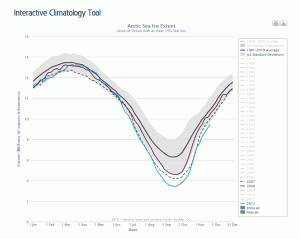 This supports the idea that the Arctic sea ice cover is continuing to thin. Models and remote sensing data also indicate this is the case. A large area of low concentration ice in the East Siberian Sea, visible in NASA Moderate Resolution Imaging Spectroradiometer (MODIS) imagery, suggests that the ice cover this year is particularly thin and dispersed this year.